One neat toy at My LotRO is a character log that tracks when you complete quests, level up, finish a crafting tier, buy a house, finish deeds, etc. The game remembers it, so Turbine makes that available to you. The game does not remember when you get loot, which I suppose is something most people would like to track; a future game or implementation could track armor sets the way the Warhammer Online Tome of Knowledge does, which I think would combine brilliantly with the cosmetic armor system (making them unlocks, not (just) inventory items). I am shaky on the practical uses for this log, other than gazing in wonder at what you were doing in-game on this date in 2008, but then toys don’t need uses. Your right that the practical purpose of such a log is iffy. The one thing is does do, is let players see their progress in the game. This can be a big moral booster for some, being able to see that they gained X levels in a week. It can help to confirm that progress is being made. 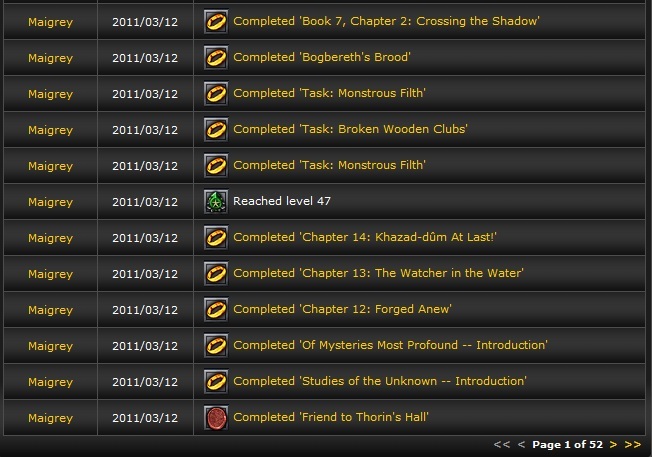 If you friend people on my.lotro, you can see their logs, so it can be a way to see how your friends are progressing or what they’ve been up to. Not radically useful, but interesting. This would probably make me limit friends to a few really good friends. I also think WoW Armory and similar logs have an issue with privacy. I don’t want everyone to know when I did what in this or that game with date and time. Cryptic allows you to switch this log off for everyone else but you (in STO), but I think this is still rather crude. More control to the user whom he wants to see which data, even if is only a deed log. For some reason people seem to have huge problems if their virtual gold would be shown, but no problem with a complete listing of their gear and when they did what ingame. European players also seem to take such things more seriously than Americans in general.